Film screen radiography has been used for years to acquire and record X-ray NDT images in a number of different modalities. The general trend is towards replacement of the radiographic film by digital acquisition systems [1,2]. It is a considerable technological challenge to get an image quality at least equivalent, and if possible better than the one obtained with a screen film system. Several technologies compete to fulfil these requirements. Among them, large area flat panel image sensors based on amorphous silicon have recently been developed for X-ray imaging applications. Providing both high resolution and high dynamic range, these image sensors are well suited to most NDT applications. This paper introduces a new high resolution digital X-ray subsystem based on a phosphor screen coupled to an array of amorphous silicon photodiodes and a-Si thin-film transistors ( TFT ) connecting the diodes to the readout electronics. The a-Si array is processed on a monolithic glass substrate. The TFT and photodiodes are deposited using large area thin film semiconductor processes. The large size of this X-ray image sensor ( 28 cm x 40 cm ), combined to a 127 µm square pixel, allows to use it in NDT filmless applications where both high resolution and large field of view are needed. The paper describes the general characteristics of this imager, and gives the main detection performance, such as dynamic range, linearity, contrast ratio and modulation transfer function (MTF). The paper describes several NDT techniques and NDT fields concerned by this X-ray image sensor along with some of the applications involving this flat panel. The imager is equipped with Gd2O2S:Tb phosphor screens of optional thickness in order to optimize either for absorption or spatial resolution. A Lanex Fine screen from Kodak is installed for the measurements reported in this paper. The density of the Gd2O2S:Tb powder phosphor is 34 mg/cm2. Throughout all measurements the x-ray radiation from a pulsed x-ray generator with a tungsten anode was used. The saturation dose (ion dose in air at the entrance of the detector) varies with the spectral characteristics of the radiation. An Al filter of 2 mm thickness was added for the graph in Fig. 1. The linearity as a function of intensity has been measured at 60 kV and 75 kV using different thicknesses of Al absorbers. The exposure time has been kept constant. The signal response versus the absorbed dose in the phosphor screen of the detector is shown in Fig. 2. The linear range extends over a dynamic range of 103. For comparison, the signal response curve of a typical x-ray film is added which demonstrates the advantage of the flat panel detector i.e. better linearity over a wider dynamic range. Fig 1: Saturation dose. Parameters: Lanex Fine screen, 34 mg/cm2 of Gd2O2S/Tb, 2 mm Al filter. Fig 2: Linearity for the flat panel detector and x-ray film. The X-ray film has a non-linear response and is limited in dynamic range. A test pattern with different diameters of Al wires has been used (6 ISO 12 Image Quality Indicator) to determine the image contrast. 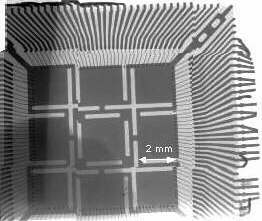 Contrast is defined here as the diameter of the smallest Al wire which is still visible in the image divided by the thickness of an Al block deposited onto the test pattern. The test pattern was placed between the Al block and the detector entrance window. The contrast ratio approaches 1% (Fig. 3), i.e. an Al wire of ¢ 0.6 mm in front of an Al block of 51 mm is still visible in the image. The signal-to-noise ratio of the visual perception is improved by the human eye because it averages along the straight lines of the wires. In general, the contrast ratio is related to the absorption ratio between wire and substrate, the scattered radiation by the substrate and the intrinsic spatial resolution of the detector. In Fig. 3 the left wing of the curve is degraded by the resolution of the detector as a result of the wire diameter close to the pixel size of 127 µm. A bar test pattern of 50 µm Pb was used to obtain the contrast transfer function (CTF). The CTF values have been averaged over all possible sampling phases. From the discrete CTF values the MTF was calculated (Fig. 4). A contrast of 20% is obtained at 4 lp/mm. Fig 3: Contrast ratio for different Al wire diameters (6 ISO 12 test pattern) at 120 kV. Fig 4: Modulation transfer function (MTF) and contrast transfer function (CTF) at 60 kV, 1 mm Al filter. The Nyquist frequency given by the pixel pitch of the imager is 3.94 lp/mm. Nevertheless, other NDT techniques such as 3D tomography, or voludensitometry, are potential users of large area flat panel detectors, which are distortion free and not subject to magnetic fields due to moving metal parts. For instance, the acquisition time for 360 projections of 7 million pixels to obtain a tomogram should be approximately 20 minutes. However, the time for the 3D reconstruction may be much longer. Fig 5: Radiography of electronic circuit. X-ray conditions : 125 kV, 50 µA, 4 µm focal spot size. Bonding wires : 25 µm diameter. The high resolution offered by this flat panel is particularly favorable to the inspection of printed circuit boards, electronic devices and connection techniques. Furthermore, the use of a microfocus X-ray tube, with typical 3-10 µm focal spot size and magnification ratios from 12 to 25 optimizes the contributions of the X-ray focal spot and the detector pixel sizes to the object sampling. It is possible to visualize and measure 25 µm diameter bonding wires ( cf Fig. 5 ). The 280 x 400 mm dimensions of this flat panel allows the inspection of large PCB's. Among the various parts involved in aeronautics and space industry, the turbine blade is maybe the most inspected component, as it is a critical device of an aeronautics assembly. Images demonstrate the detection of tiny cracks in a blade, as well as the conformity control of its internal structure. The detector is linear over a wider dynamic range than film. This feature is particularly important for quantitative measurements and X-ray Computed Tomography. B.Munier, R.Sottoriva, P.De Groot, "New Multilinear Solid State Detector for Digital Slot Scan Radiography", SPIE Medical Imaging, February 1999. R.L.Weisfield, M.Hartney, R.Schneider,K.Aflatooni, R.Lujan, "High Performance Amorphous Silicon Image Sensor for X-ray Diagnostic Medical Imaging Applications", SPIE Medical Imaging, February 1999.